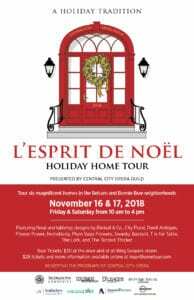 The 42nd Annual L’Esprit De Noel Holiday Home Tour, presented by Central City Opera, is scheduled for Friday-Saturday, November 16-17, 2018. The tour takes place from 10 a.m. to 4 p.m. each day. This year’s six featured homes are located in the beautiful Belcaro and Bonnie Brae neighborhoods of Denver. City Floral will once again participate as a premier designer of one of the selected homes. For complete details or to purchase tickets, click here. City Floral will be giving away eight sets of tickets for the event. Stop by the greenhouse to shop and then register for the giveaway on your way out. We will be drawing the winners names Thursday, November 15. Previous Post: « Welcome to the New City Floral Website!